Two development partners have abandoned a joint effort to redevelop a 3.5-acre, city-owned parcel on South Park Street, with one seeking to move forward with a $24.8 million project including housing and a grocery store on the site and the other planning a $75 million medical clinic and parking on adjacent property. In April, two teams — Hovde Properties/SSM Health and Welton Enterprises — each offered pricey, competing proposals to redevelop the vacant property at 1402 S. Park St., which once held the now-demolished Truman Olson U.S. Army Reserve Center. 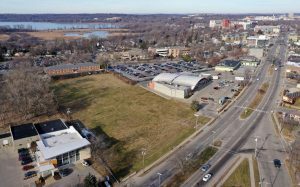 But in the summer, the teams, which also have properties abutting the Truman-Olson site, asked the city to put its review on hold so they could combine proposals and forge a larger, more comprehensive plan for the area. Now, SSM Health is no longer pursuing a development at the Truman-Olson property. Welton, which owns property to the immediate north that holds a 26,000-square-foot Pick ‘n Save grocery at 1312 S. Park St., has offered a revised proposal calling for a 40,355-square-foot grocery with a parking lot and a separate five-story building with 69 housing units and 81 parking spaces, almost all underground. The company is seeking roughly $4.5 million to $4.7 million in city financial assistance for the revised project, called Truman Commons, including a discount on land costs, tax incremental financing (TIF) and support from the city’s Affordable Housing Fund. 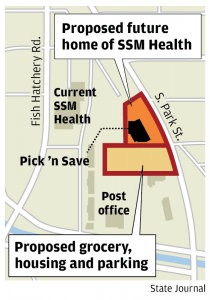 SSM Health, meanwhile, is moving to acquire the grocery store property from Welton to build a 176,000-square-foot medical clinic to replace its aging, existing facility at 1313 Fish Hatchery Road, SSM director of facilities management Brandon King said. SSM would also expand and improve an existing parking lot behind the clinic, he said. Although SSM Health and Welton are not doing a joint project, the two are continuing to collaborate to minimize the time between closure of the existing grocery store and the opening of a new, larger one, and to coordinate public improvements necessary for both projects, King and Welton vice president Paul Molinaro said. SSM anticipates submitting a land use application in the summer and hopes to secure approvals and begin construction in the fall, King said. In addition, SSM intends to make further refinements to its long-term vision for its entire Fish Hatchery campus including potential future buildings and a parking structure, King said. SSM does not have a budget for those improvements, he said. “The area has been a vital location for patients of Dean Medical Group for over 50 years, and the idea is for SSM to reinvest in the area and work together with the community to plan for the future,” he said. The city’s Truman Olson Selection Committee received an update from SSM Health and Welton on Tuesday evening and asked city staff to analyze Welton’s revised proposal with the intent to meet again in about three weeks. The committee could recommend to move forward and negotiate a letter of intent with Welton, seek changes in Welton’s proposal, or open a new request for developer proposals, said Matt Mikolajewski, city economic development director. The city acquired the Truman-Olson property in 2012, with a priority of extending Cedar Street through the site, and issued a request for proposals to four adjacent property owners in October 2017. Hovde/SSM and Welton responded. Initially, Hovde/SSM proposed a $45 million mixed-use project including a health clinic, grocery store, retail space with pharmacy and housing. SSM owns 13 acres in the triangle largely along Fish Hatchery Road and is the triangle’s largest property owner. Welton included two options in its initial proposal. The first, roughly $44 million option included a 25,000-square-foot grocery store, 72 low-income housing units and 100 apartments, office or clinic space and a parking structure. A second, roughly $21 million option had far less housing and no office or clinic space. Its revised proposal, which is closer to the second, more modest original option but with a much bigger grocery store in response to neighborhood desires, seeks a discount of $700,000 to $900,000 for the land, which is appraised at between $1.9 million and $2.1 million; $2.25 million in TIF support for the apartments and grocery store, and $1.57 million from the city’s Affordable Housing fund.